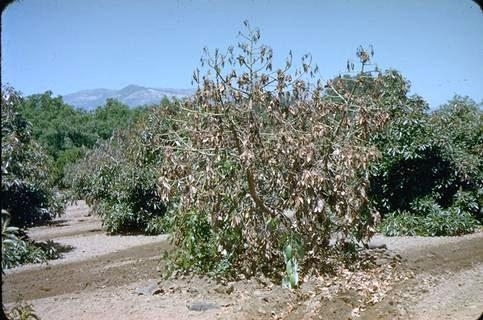 The entire tree or only one or several branches wilt suddenly when affected by Verticillium wilt. Leaves turn brown and die, but the dead leaves usually remain on the tree for several months. Brown to gray-brown streaks are visible in the xylem of the branches or roots when the bark is removed. Sometimes the streaking is visible in the branches, but often it is found at the base of the trunk. Trees with Verticillium wilt often send out new, vigorous shoots within a few months after the initial wilting. If well cared for, affected trees often recover completely with no reoccurrence of the disease. However, not all trees survive an infection and disease symptoms sometimes reoccur after an apparent recovery. The fungal pathogen Verticillium dahliae infects many hosts, including various berry and flower crops, cotton, eggplant, olive, pepper, stone fruit trees, strawberry, and tomato. 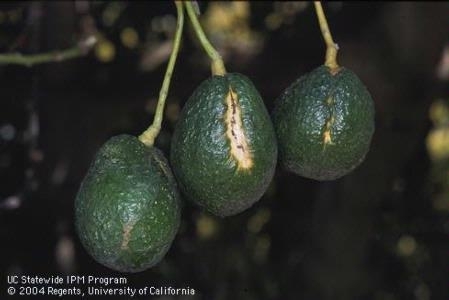 Verticillium wilt is present throughout the state but is less common in avocado than root rot and canker diseases. Verticillium dahliae persists for years as microsclerotia in soil. Microsclerotia spread in infested organic matter and soil that is moved. The fungus infects through feeder roots, and then moves up in the water-conducting xylem system, restricting or preventing water movement to foliage from the roots. 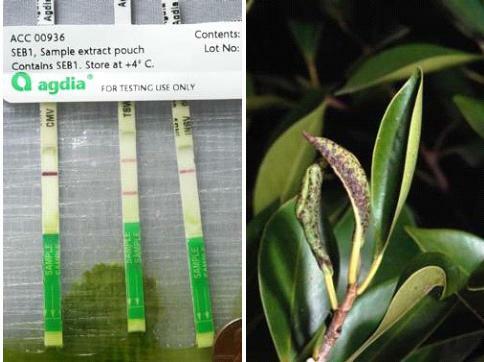 No known methods are effective in curing infected trees. Trees often recover completely and display no further symptoms, even though they are still infected. After dieback ceases and new growth begins, prune off dead branches. Provide optimal irrigation and modest fertilization to promote new growth. If a tree dies from Verticillium, remove it. But give it a chance, there's a good chance it will recover. In areas where V. dahliae is known to occur, plant Mexican rootstocks instead of the more Verticillium-susceptible Guatemalan rootstocks. 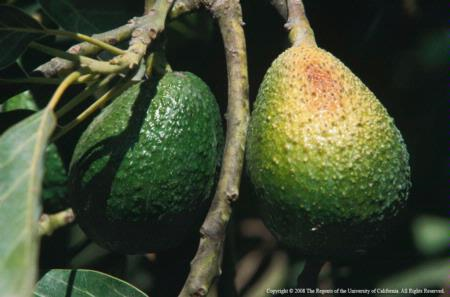 Do not plant avocado on land where crops susceptible to Verticillium wilt have previously grown. 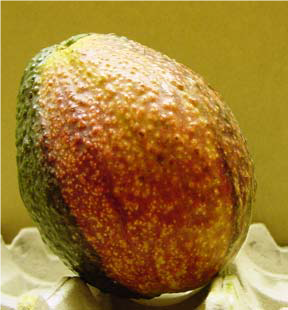 Do not interplant avocado with other hosts of Verticillium, which are listed in publications such as Plants Resistant or Susceptible to Verticillium Wilt (PDF). 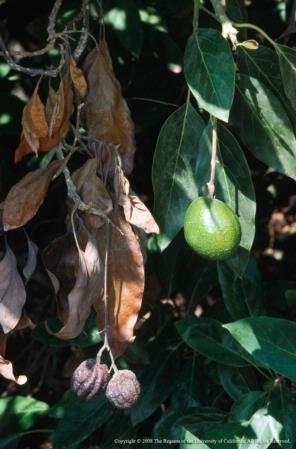 Even if they have recovered, do not use trees infected with Verticillium wilt as a source of budwood or seed. Abiotic disorders are plant problems that are non-infective. They are not caused by an organism, but through their damage, they may bring on damage caused by organisms. Think of a tree hit by lightning or a tractor. 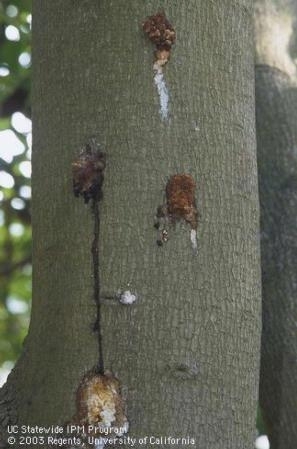 The damage breaches the protective bark which allows fungi to start working on the damaged area, eventually leading to a decayed trunk. It was the mechanical damage, though that set the process in motion. Too much or too little water can also predispose a plant to disease. Think of Phytophthora root rot or even asphyxiation that can come from waterlogging or too frequent irrigations. Lack of water and especially sufficient rainfall can lead to salinity and specific salts like boron, sodium and chloride accumulating in the root zone. This happens from a lack of leaching that removes native soil salts from the root zone or the salts from the previous salt-laden irrigation from the root zone. 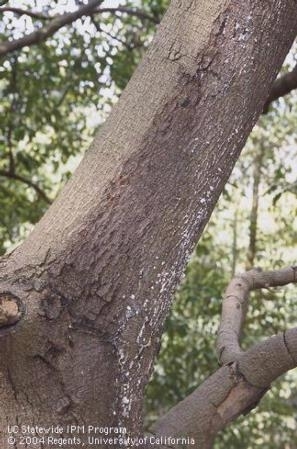 These salts cause their own kind of damage, but they can also predispose a tree to disorders, disease and invertebrate (insect and mite) damage. 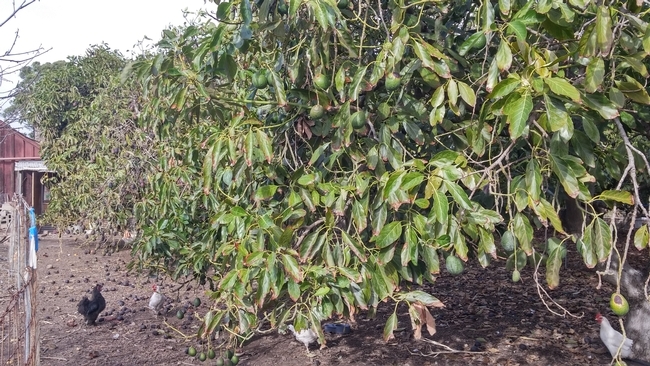 As the lack of leaching advances (lack of rainfall and sufficient irrigation leaching) the canopy thins from leaf drop, exposing fruit to sunburn and fruit shriveling. 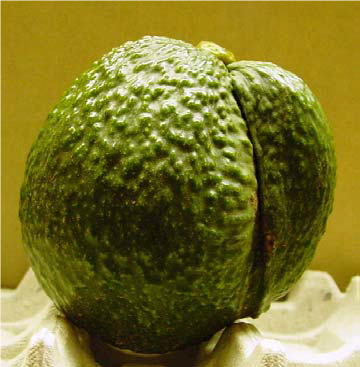 Leaf drop and fruit shriveling in avocado. 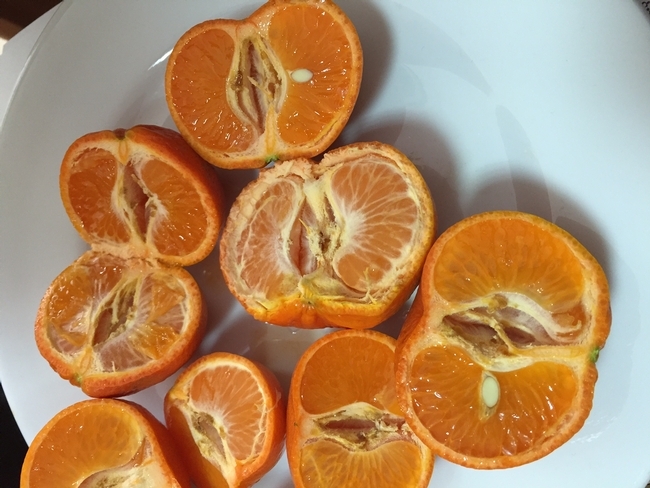 In the case of sensitive citrus varieties like mandarins, water stress can lead to a pithy core with darker colored seeds, almost as if the fruit had matured too long on the tree. 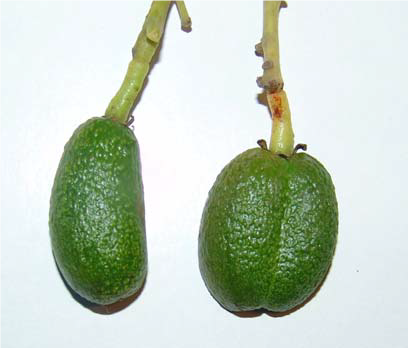 Total salinity plays an important factor in plant disorder, but also the specific salts. 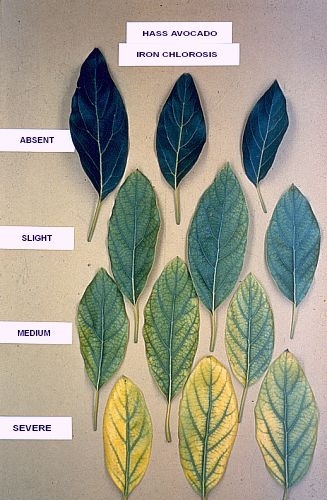 These salts accumulate in the older leaves, and cause characteristic symptoms that are characteristic in most trees. 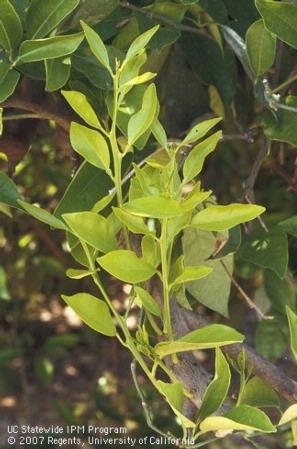 Boron will appear on older leaves, causing an initial terminal yellowing in the leaf that gradually turns to a tip burn. Often times it is hard to distinguish between chloride, sodium and total salinity damage. It is somewhat a moot point, since the method to control all of them is the same – increased leaching. There is no amendment or fertilizer that can be applied that will correct this problem. The damage symptoms do not go away until the leaf drops and a new one replaces it. By that time hopefully rain and/or a more efficient irrigation program has been put in place. 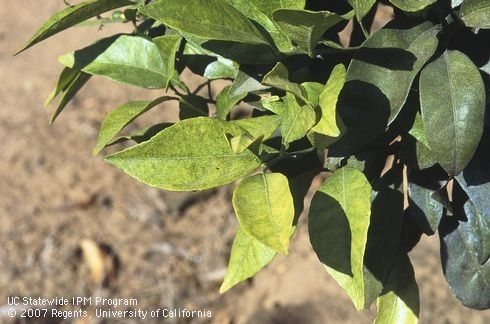 Salinity and drought stress can also lead to mineral deficiencies. This is either due to the lack of water movement carrying nutrients or to direct completion for nutrients. A common deficiency for drought stressed plants is nitrogen deficiency from lack of water entraining that nutrient into the plant. This usually starts out in the older tissue and gradually spreads to the younger tissue in more advanced cases. The salts in the root zone can also lead to competition for uptake of other nutrients like calcium and potassium. Apples and tomatoes are famous for blossom end rot when calcium uptake is low, but we have also seen it in citrus. 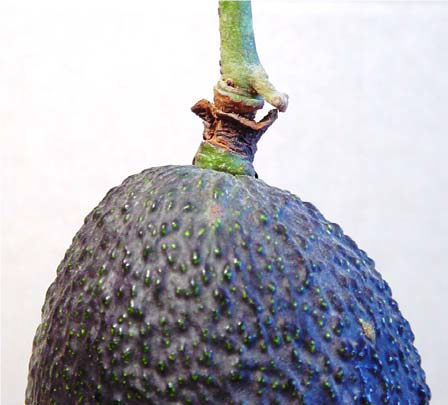 Low calcium in avocado, and many other fruits, leads to lower shelf life. Sodium and boron accumulation in the root zone can lead to induced calcium deficiencies and increased sodium can also further lead to potassium deficiencies. Leaching can help remove these competitive elements. Drought and salt stress can also lead to disease, but in many cases once the problem has been dealt with the disease symptoms slowly disappear. 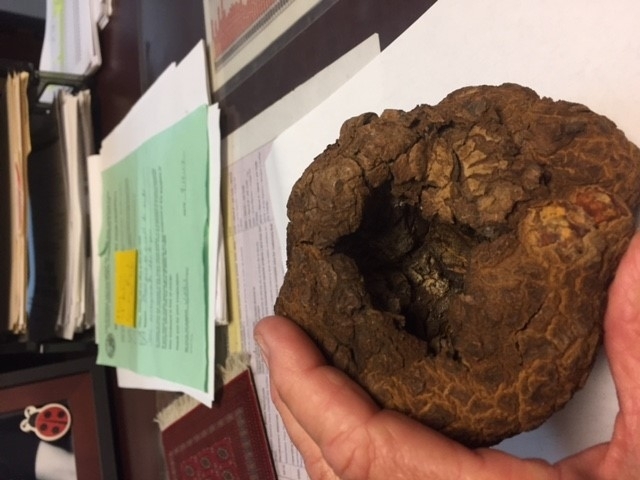 They are secondary pathogens and unless it is a young tree (under three years of age) or one blighted with a more aggressive disease, the disease condition is not fatal. Often times, in the best of years, on hilly ground these diseases might be seen where water pressure is lowest or there are broken or clogged emitters. 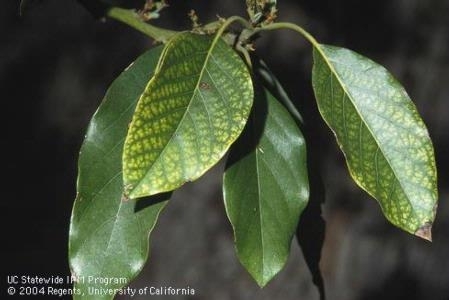 The symptoms are many – leaf blights, cankers, dieback, gummosis – but they are all caused by decomposing fungi that are found in the decaying material found in orchards, especially in the naturally occurring avocado mulch or artificially mulched orchards. Many of these fungi are related Botryosphaerias, but we once lumped then all under the fungus Dothiorella. These decay fungi will go to all manner of plant species, from citrus to roses to Brazilian pepper. 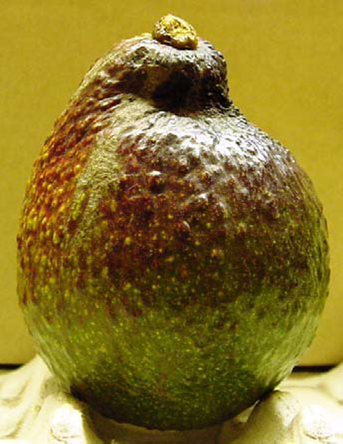 Another secondary pathogen that clears up as soon as the stress is relieved is bacterial canker in avocado. 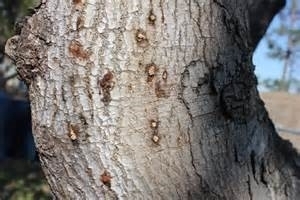 These ugly cankers form white crusted circles that ooze sap, but when the tree is healthy again, the cankers dry up with a little bark flap where the canker had been. Many borers are attracted to water stressed trees and it is possible that the Polyphagous and Kuroshio Shot Hole Borers are more attracted to those trees. 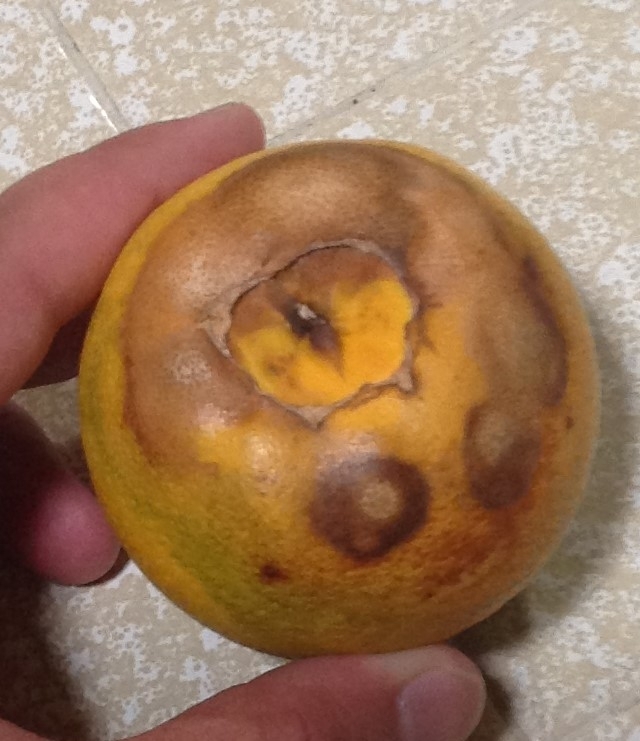 And then we have conditions like Valencia rind stain that also appears in other citrus varieties. 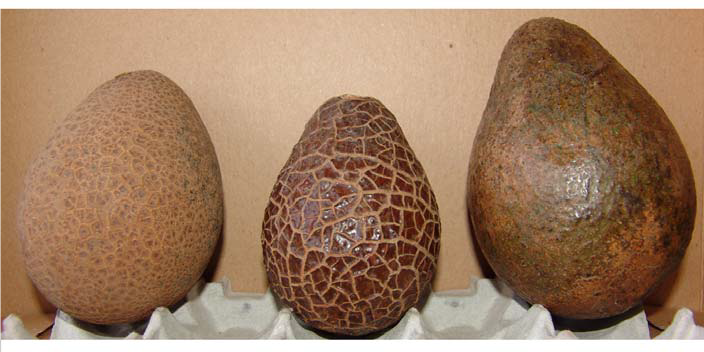 We know it will show up in water stressed trees, but we aren't sure what the mechanism that causes this rind breakdown just at color break. Could it be from thrips attracted to the stressed tree or a nutrient imbalance, it's not clear? Water and salt stress can have all manner of effects on tree growth. It should lead to smaller trees, smaller crops and smaller fruit. The only way to manage this condition is through irrigation management. Using all the tools available, such as CIMIS, soil probes, soil sensors, your eyes, etc. and good quality available water are the way to improve management of the orchard to avoid these problems. information is analyzed and do not make unwarranted assumptions. pathogen, resulting in possible misdiagnoses. very sensitive to high temperatures and drying conditions. mites, slugs and snails cause damage while feeding on the plant (fig. mouthparts that result in dried out, bleached plant tissue. 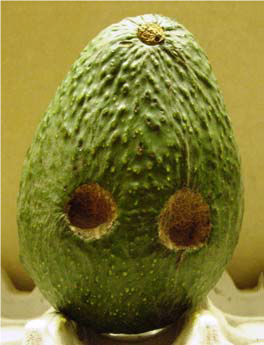 parts and sometimes consume entire plants. provides a medium for the growth of sooty mold. tolerable limits, or when an applicator makes a careless application. group to narrow the analysis. Insecticides and fungicides occasionally cause obvious plant damage. 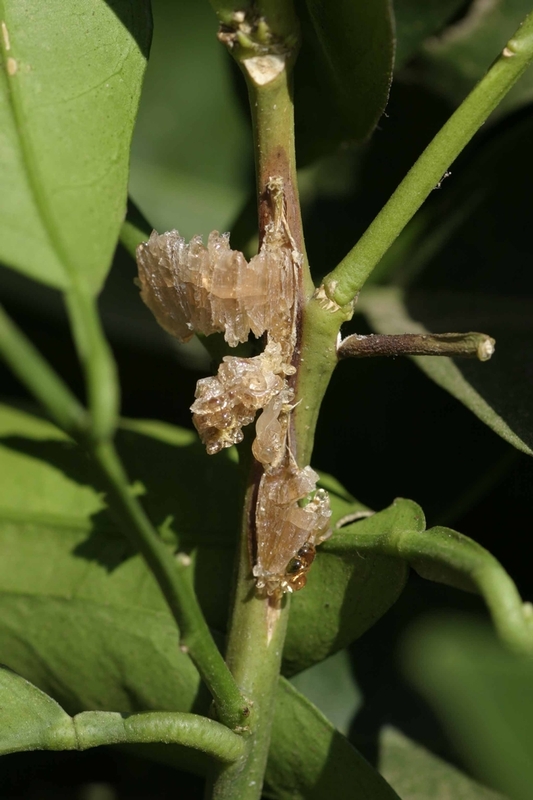 pathogens and can attract boring insects to woody stems. are quite desirable. 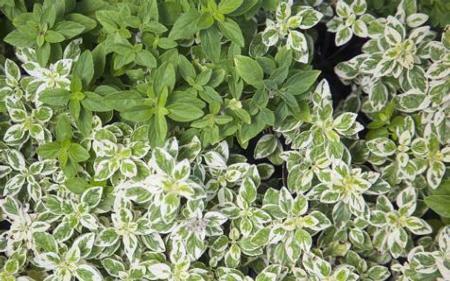 Sometimes variegation can be caused by viruses. disorders usually do not arise from a specific shoot as with chimeras. Boger P, Sandmann G. 1989. Target sites of herbicide action. Boca Raton, FL: CRC Press.